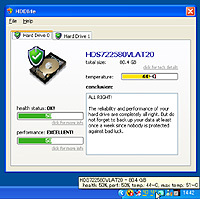 □HDDlife - freeware real-time hard-drive monitoring utility with alerts, malfunction protection and data loss prevention functions. This hard-drive inspector is a proactive hard drive failure detection system that controls 100% of hard-drive risks. Copyright ©2005 Impress Corporation, an Impress Group company. All rights reserved.